Thanks to these people and organizations for shaping the people and parents we are today. The Front Row Foundation- Our mission is to help individuals and families who are braving critical health challenges “live life in the front row™”. 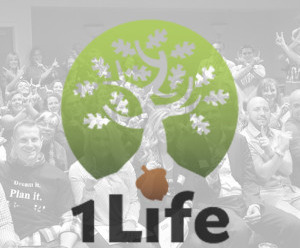 1 Life Fully Lived- Our Mission is to Help People Dream, Plan and Live Their Best Lives. Jenai Lane- Founder of Spirit Coach Training. Awaken Your Divine Potential. Co-Create Your Best Life. Brotha James- PASSION- POWER- PURPOSE Music with a Message. Keller Williams Realty- Careers Worth Having. Businesses Worth Owning. Lives Worth Living. GoBundance- The Tribe for Healthy, Wealthy, Generous Men who Choose to Live EPIC Lives. GRAB LIFE BIG! Hal Elrod- Hal Elrod is the author of the #1 best-selling book “The Miracle Morning” (which has 1,400+ five-star reviews on Amazon). David Osborn- David lives life with passion! He is a businessman, serial entrepreneur, adventurer and family man. He's author of the yet to be released book Wealth Can't Wait. Rock Thomas- Rock mixes real-life business experience and a track record of proven success with thought-provoking ideas and a dynamic, down-to-earth delivery. Board Meetings International- The only organization built for entrepreneur families. We reconnect the family, teach folks the principles of living balanced lives, and educate kids on the true principles of success. Thousands of entrepreneur families use our tools to grow, connect, and change the world together. Flourishing Leadership Institute- Inspired by the latest research in Positive Psychology, Design Thinking, Biomimicry, High Purpose Leadership, and Positive Organizational Design. Gary Keller- As a coach and keynote speaker, he has helped countless others find success narrowing down their ONE thing. Unsurprising to those who know him, his greatest achievement is the life he’s built with wife Mary and their son John. Honoree Corder- My mission is to inspire and motivate people to turn their vision and dreams into their real-life reality, sharing a leading-edge process I originally created for myself, and then eventually shared with my executive and business coaching clients. Open Connections- A supportive community that nurtures life-long learning. Our vision is a world where all young people develop the foundation for a self-directed life of purpose and fulfillment. Our mission is to help young people and adults develop the tools needed to create the life they want, full of purpose and fulfillment.